But I’ve never really made it on my own. Ok, just kidding. I’ve made a few different versions of curry once or twice before but never this recipe, which is my dad’s, and also my favorite. Go figure. I’ve shamefully relied on him to cook it every time I got a craving but I got a subtle hint a few weeks ago when I visited home. Dad gave me a little tub of the curry powder and said, “Here’s enough for when you want to make it again.” I got the hint. It was time to attempt this on my own. Nervousness set in. It’s not a hard dish to make, but it does have a lot of steps. Being the perfectionist that I am, I wanted it to come out EXACTLY the way I love it. I was in for a hefty challenge. TopChef style. Step 1: Bring a large pot of water to boil – large enough to comfortably fit all fish fillets. 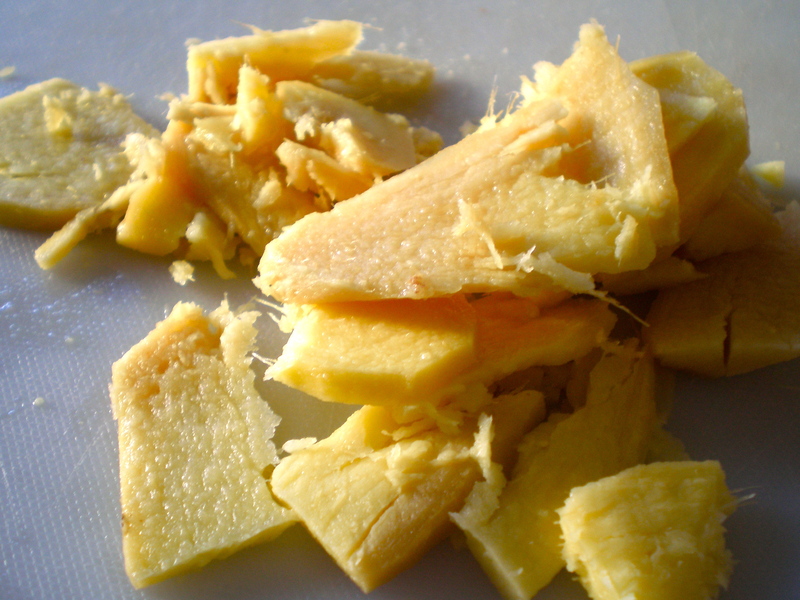 Step 3: Pound the ginger with a mortar and pestle (or with your knife) then add the ginger to the pot of water and allow to boil for at least 30 minutes. 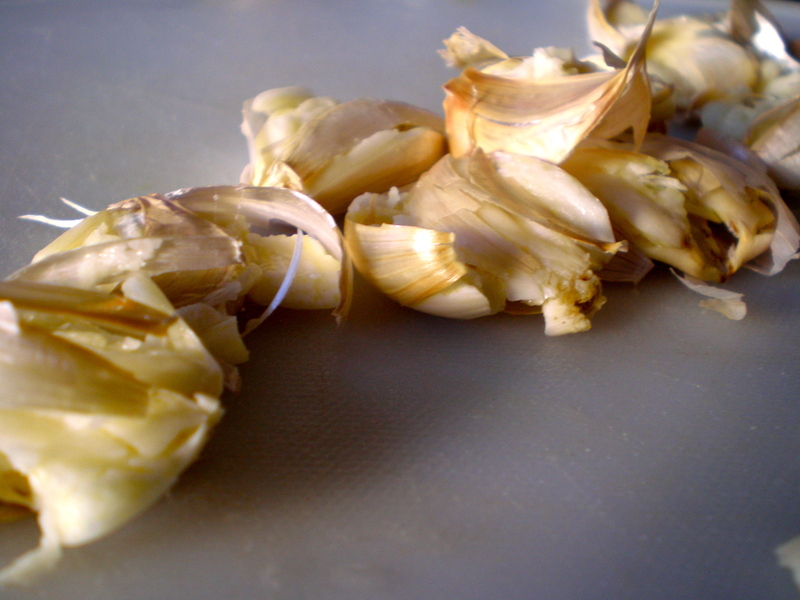 Step 4: While the ginger water is boiling, crush the garlic gloves, peel and mince. Set aside. Step 5. 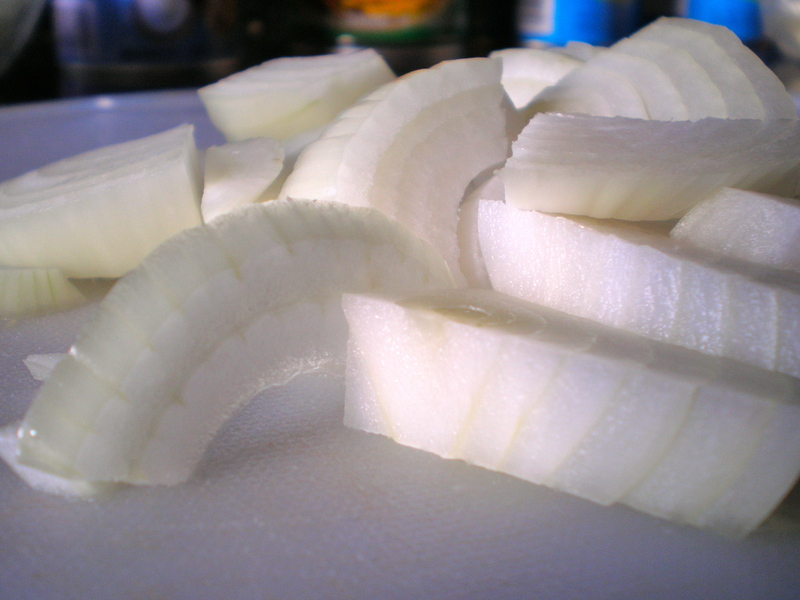 Slice the onion into half moons. Step 6. 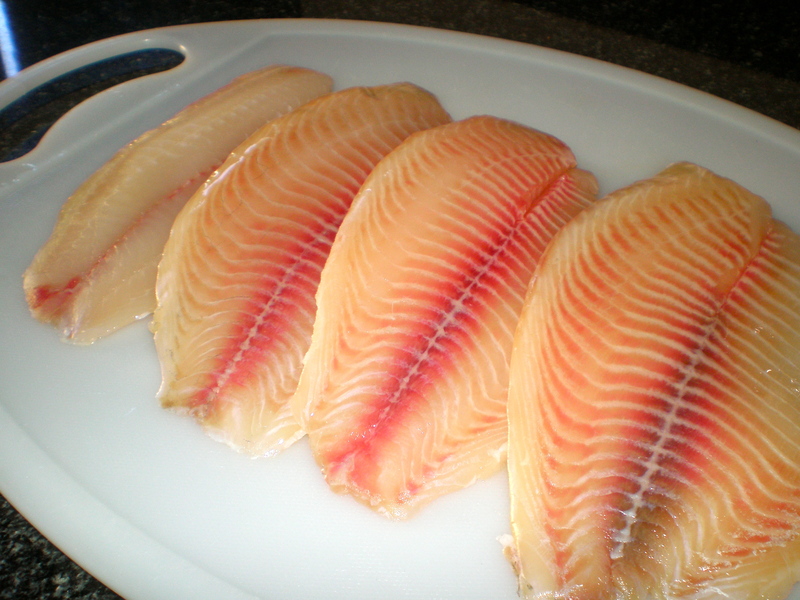 Take fish fillets and give them a quick rinse after taking them out of the packaging. *If you didn’t thaw them the night before, take the fillets out of the bag and submerge them in a huge bowl of cold water. Don’t remove the fish from the plastic vacuum pack. Change out the water every 20 minutes. They will thaw in 1 hour. I strongly advice against using the microwave to defrost these fillets since their thickness is uneven. You’ll end up cooking the fish on one side = no bueno. Step 7. 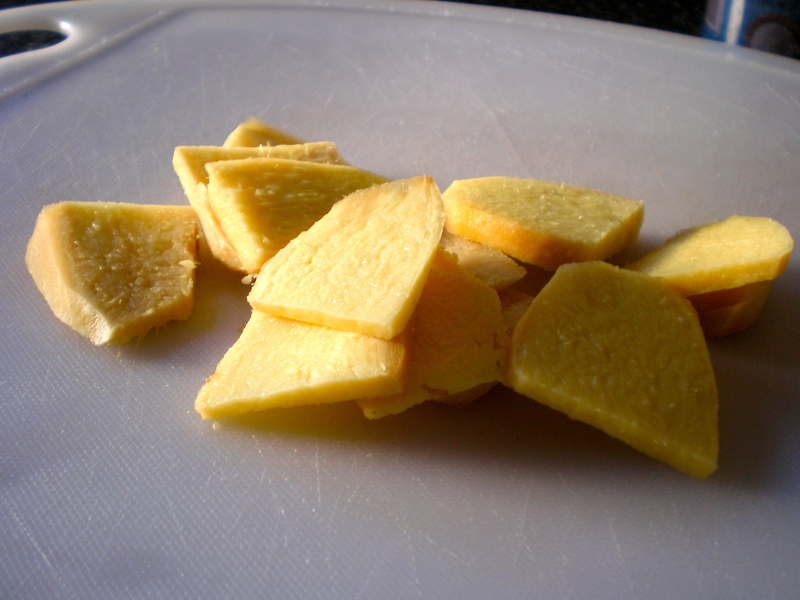 Slice the fillets in half along the midline and then add them to the ginger water that has been boiling for at least 30 minutes. 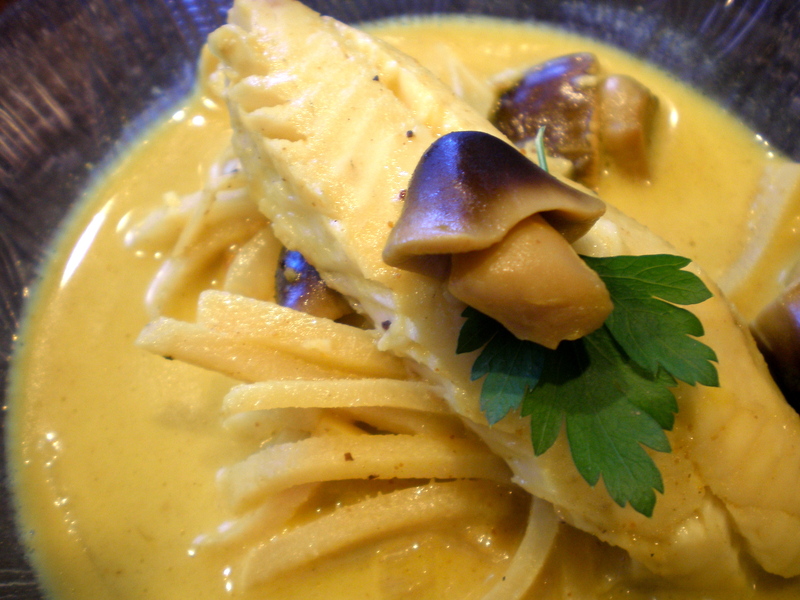 Cook the fish for 4-5 minutes then gently take them out and set aside on a plate. You want the pieces to remain intact. Cooking the fish in ginger water helps to take out that fishy smell that can otherwise linger long after you’ve cooked your fish. A total meal spoiler for sure. Ick. Step 8. Set aside the ginger water, DO NOT throw away. Step 9. 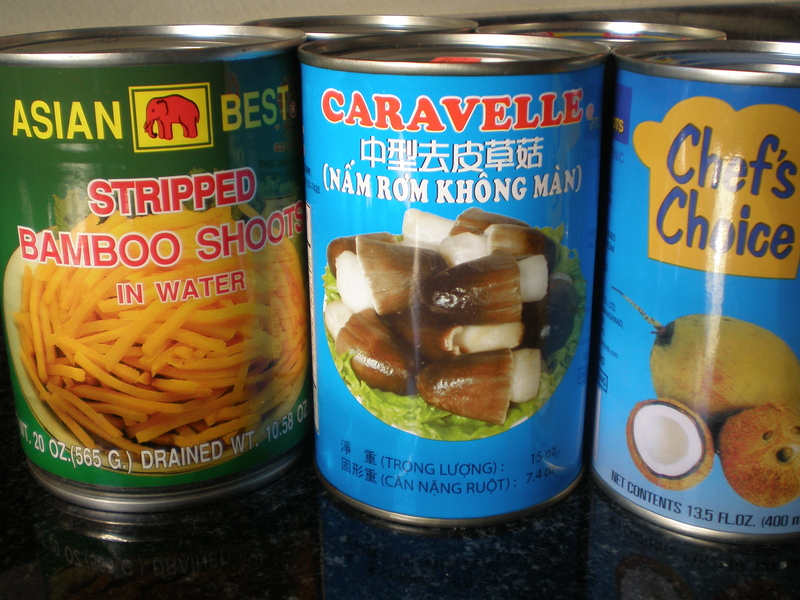 Open mushroom and bamboo shoot cans. Drain the water and set aside. Open coconut milk. Set aside. Step 10. In another large pot, pour enough olive oil to cover the surface and turn the heat to medium. 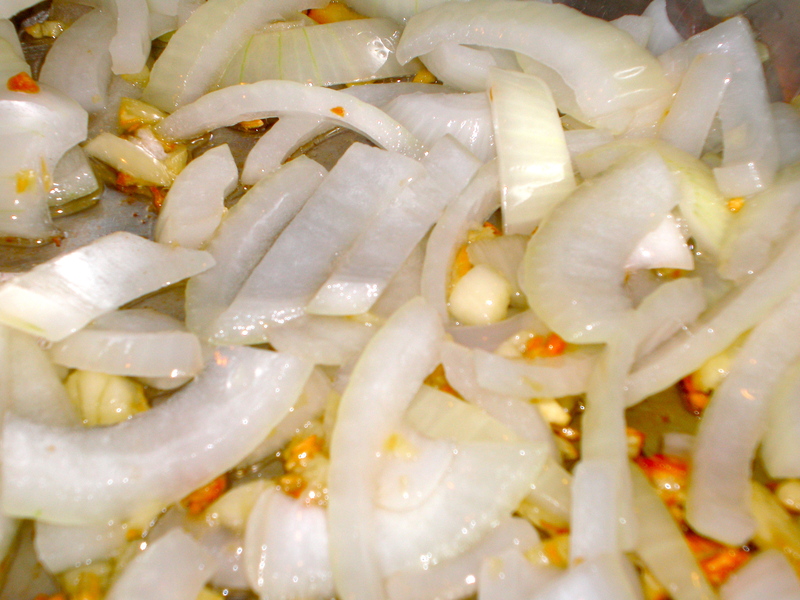 When the oil is hot, add the garlic and saute for about 30 seconds then add the onions. Saute until the onions are caramelized. Now here comes the tricky part folks. And I mean tricky. As much as I love coconut milk, I’m always weary of its volatility. It boils quickly, which means it burns quickly, bubbles over quickly, and also evaporates quickly. If you over evaporate, all the milk will disappear and you’ll be left with all the oil. We don’t want this. You’ve gone too far to burn this up now (haha). It’s ok, I’ve burnt coconut milk once or twice…err a couple times before. Step 13. Crank the temperature to high. Pour in the two cans of coconut milk into the pot. Stir, stir, and stir like crazy. If you have an extra set of hands, make this their designated job for the rest of the dish. If not, just keep a close eye on it and keep stirring while you finish the rest of the steps. Sorry, I didn’t take any pics of this part because of aforementioned warning above. Step 14. 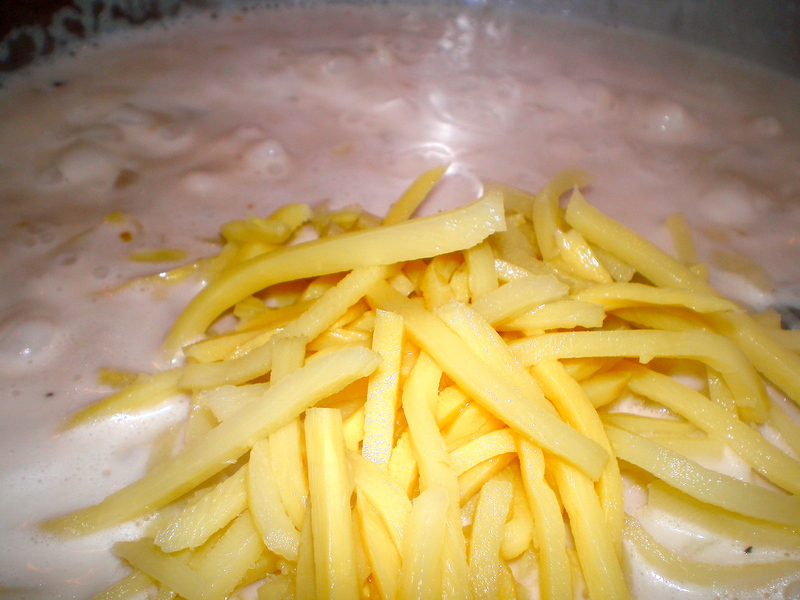 Continue stirring the coconut milk vigilantly until the consistency thickens, about 15 to 20 minutes. 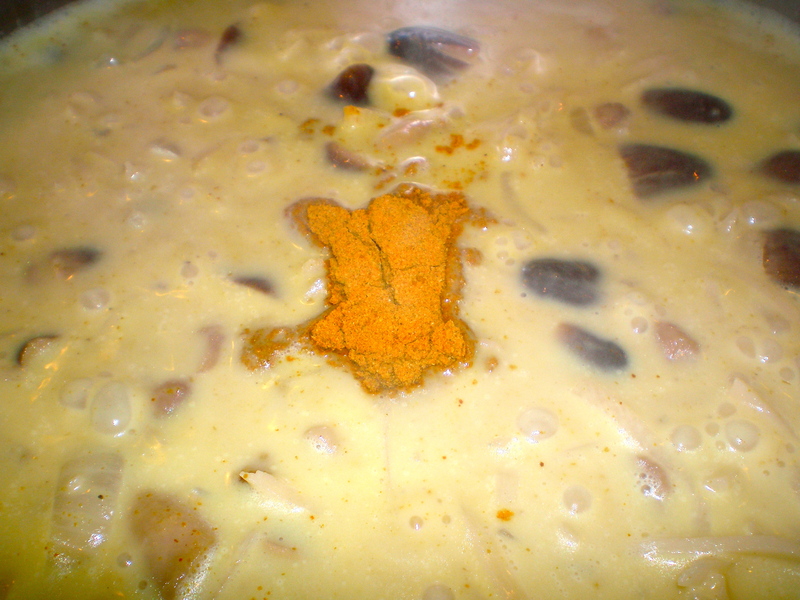 The milk should take on a creamy thick consistency, not as thick as gravy, but not as thin as milk. The color will also turn a slight twinge of brown (can you see it?). It’s quite subtle, so if you miss it, that’s ok. Just look for the right consistency. When the coconut is nice and creamy (the aroma is to die forrrrrr), add the bamboo shoots then add 1.5 cups of the ginger broth. Season with salt and pepper and allow to cook for about 10 minutes. Step 15. Next, add the mushrooms to the pot and allow to cook for 10 minutes. 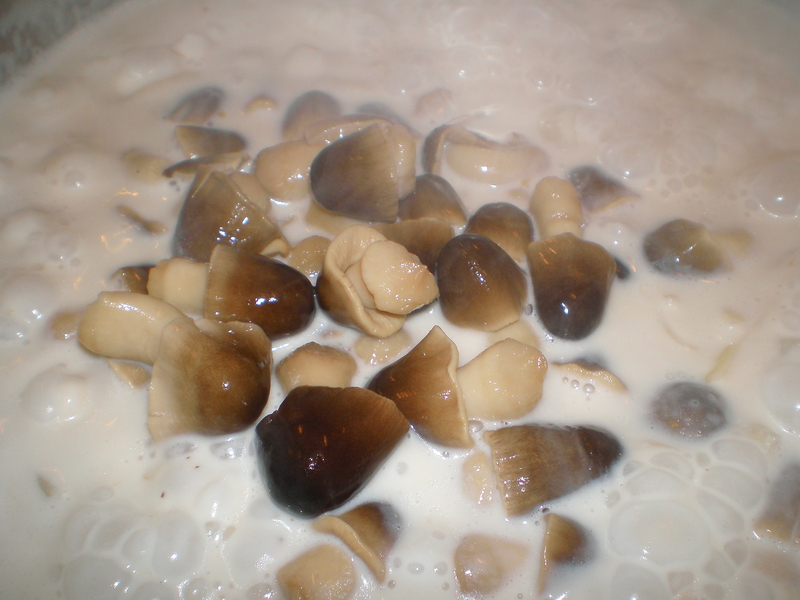 I like to give the mushrooms and bamboo shoots quick rinse beforehand to wash out the canned water taste. Step 16. 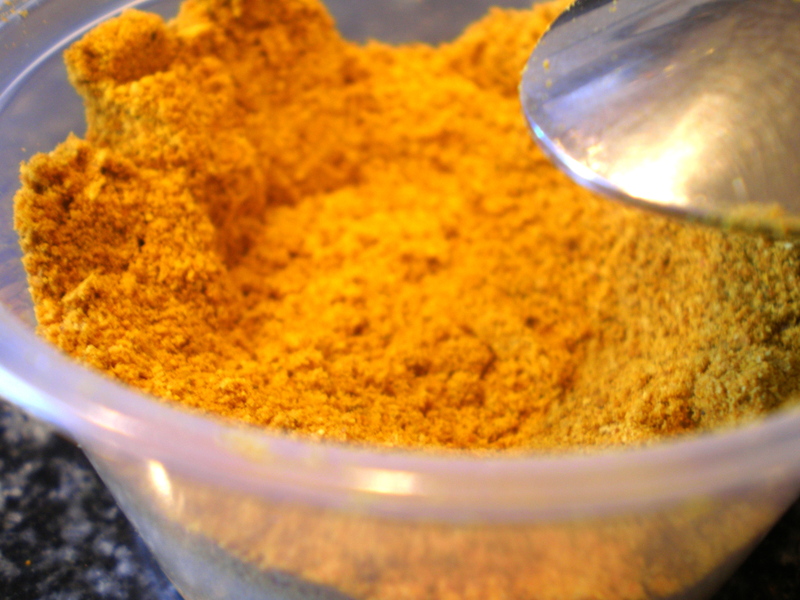 Next, add the curry powder. Watch it paint the milk that golden yellow sunshine goodness. Love it, inhale it, taste it. Mmmm. Season with salt and pepper as needed. Step 17. 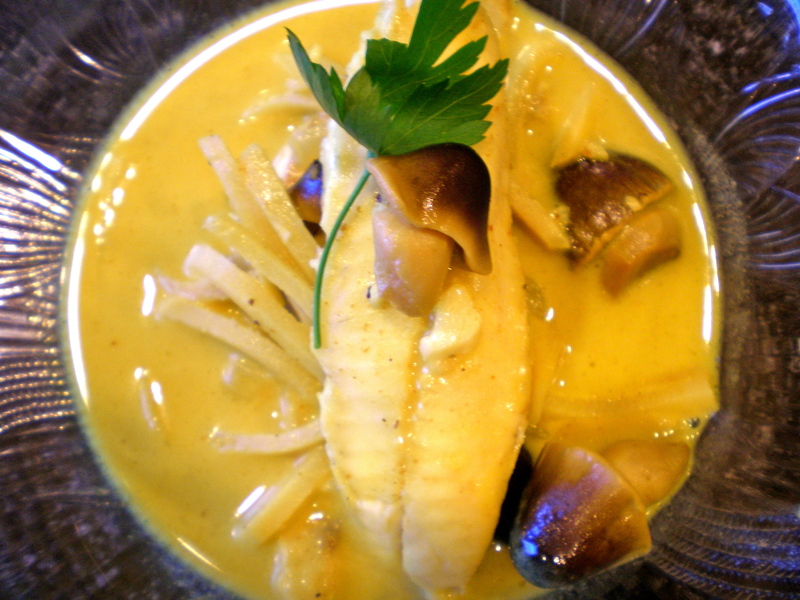 When the curry is completely dissolved and seasoned, gently add the fish. Turn the temperature to low and allow the fish to cook for 10 minutes. 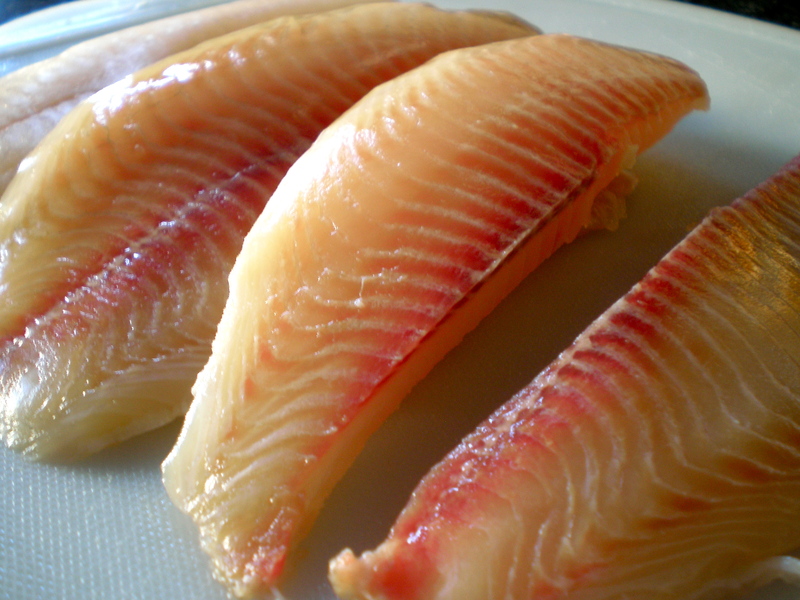 Be careful when mixing the Tilapia into the sauce to ensure the fillets remain intact. Step 18. Add a generous amount of cayenne pepper and a few chopped parsley leaves. Serve & enjoy. I love to eat this with hot, steamy, white rice. Oh my goodness get me a fan, I might faint from this crazy love affair. Not bad for a first attempt. The creaminess of the coconut milk was at a good consistency and the Tilapia was buttery soft yet firm. The bamboo shoots gave the dish a good crunch and the mushrooms..well I love these things in just about anything. Luckily, I managed to fish out an intact piece (har har pun intended) for this pic. I definitely need to be more gentle in mixing in the fillets. I’ll blame it on the extra enthusiasm. Next time, I’d like to try adding some kind of leafy veggie or eggplant or perhaps some shrimp. Hmmm. Finally, a taste of home, a coupla hundred miles closer. yum yum yum this is the only fish dish I never get tired of. I looove it!